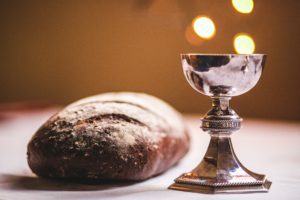 For many years now, whenever I’ve celebrated Holy Communion I’ve silently prayed for each person by name as they come forward to receive the bread and dip it into the cup. I started this early on as a pastor and have continued it as my personal participation worshiping in the congregation. Ever since doing research for my first book, Afire With God, I’ve been fascinated by the idea of koinonia, Communion community. It’s hard to define but often a palpable experience: the mutuality of giving and receiving. In Romans 15:25-27, Paul invites the Gentile Christians to share material blessings with the Jewish church in Jerusalem, in gratitude for the spiritual blessings God gave them through the Jews’ inheritance of the gospel. There’s a fulfilling wholeness and balance (which is the meaning of shalom) in giving and receiving God’s blessings from one people to another. And from one person to another, as well. In the church where I worship, as our pastor invites people forward, I thank God for the gifts of each one of them, for their love for God and their up-and-down faith journey, and ask God’s blessing on them. This giving and receiving springs from the gospel and is the heart of community, balanced on the fulcrum of God’s grace.